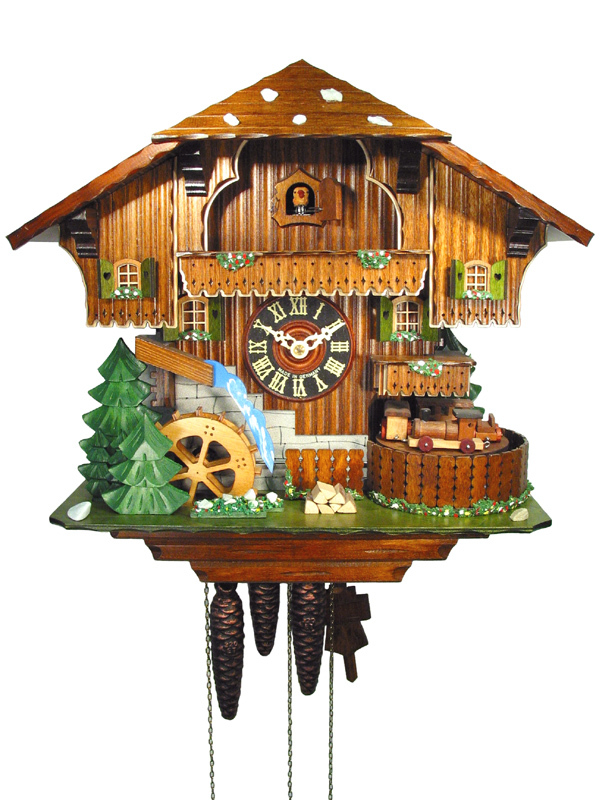 Cuckoo Clock with 1-day movement / running time (mechanical); Music function, moving little train and mill-wheel. 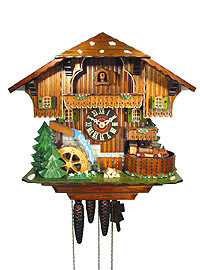 This is a chalet clock in remembrance of the famous Black Forest Train Line. Built between 1863 und 1873, this train line is still the only high mountain railway line in Germany. It has 39 tunnels on a stretch of 150km and was one of the most impressive building projects in Germany during the 19th century. The clock has a little train going round and round to the right of the clock. It moves with the music of the clock. There is also a turning mill-wheel. Each time the clock strikes, both the train and the mill-wheel start to move. High quality Swiss music box (Reuge), 2 melodies: Edelweiss and Happy Wanderer.